Our fall season is in full swing. The Head of the Charles was this past weekend. Conditions were wicked windy. In total, VRA raced 6 boats; 3 undergrad and 3 alumni. The overall tone of the weekend was a bit bittersweet. We are delighted to report that no alumni were killed by hopping back into boats. The results on the undergrad side serve as a reminder that this truly is a rebuilding year for the program and that there is ample work to be done before the spring rolls around. Thanks to the ongoing work of the Class of 2003, we were able to acquire a new (to us) eight in the deal of the century. Before it hit the water in Boston, we had an impromptu christening with all the alumni in town. Nicholas Jablonski ’03 and Rob Janiczek ’03 did the honors of pouring champagne on the bow of The People’s Eight. The additional eight joining the fleet will ease the team’s growing pains after brilliant retention of last year’s novice class and will help ensure everyone has a seat on the water. More alumni than ever joined us in Boston this year. Three eights duked it out in a total field of 48 entries. 8 of 9 of the 2011 National Championship winning crew made the trip. The Reunion Crew took 14th with a time of 16:03.199. The other two eights were stacked based on speed. 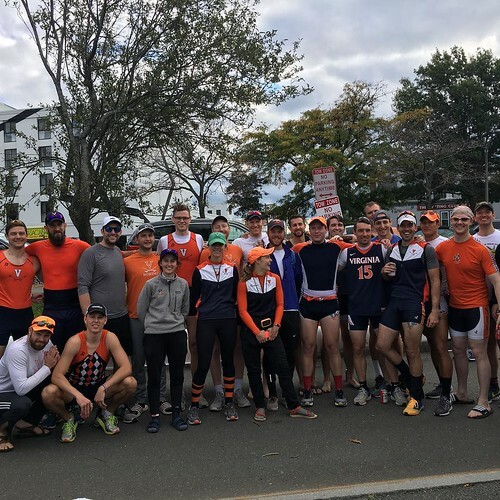 The boat internally dubbed “the Best of the Rest” topped the Reunion Crew by 7 seconds, claiming 11th with a time of 15:56.009. The third eight rowed the new eight for its inaugural race, under the banner of the Charlottesville Postal Workers. They placed 30th with a time of 16:39.867. The club four was a young crew composed of one first year and four second years, that also rowed under the banner of the Charlottesville Postal Workers. They placed 11th in a field of 55 entries with a time of 17:50.456. The Collegiate Four laid down a solid piece claiming 4th place in a field of 40 entries. They finished with a time of 18:55.630 and were bested only by three crews who stacked their program’s best guys into their fours. The V8 is also a young crew, with a majority of underclassmen in the line-up. They placed 19th in a field of 35 entries with a time of 17:09.652. The whole team will be in action this weekend at the Head of the Schuylkill in Philadelphia. We hope you can join us in Charlottesville for Class Day Races and Alumni Weekend on November 17th!